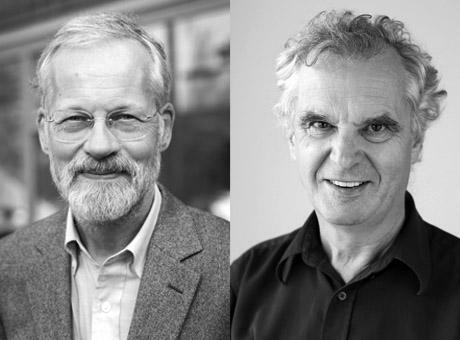 The Bartlett School of Architecture at UCL is pleased to announce the appointment of leading industry professionals Robert Aish as Visiting Professor in Design Computation and Mark Whitby as Visiting Professor in Structural Engineering, effective from March 2014. Robert Aish has over the last four decades, played a pivotal role in the development of new computational technologies in architecture. As Director of Software Development at Autodesk, he led the recent development of the ‘DesignScript’, a special end-user programming language for architectural computation. At Bentley Systems his ‘GenerativeComponents’ parametric design application was used in the design of the Velodrome at the 2012 Olympics. He is cofounder of the Smartgeometry group, and through his teaching and publications, he has helped to create a vital bridge between architectural education and practice. Engineer Mark Whitby, has contributed to the success of a generation of renowned architectural practices. Notable projects include the York and Lancaster Millennium bridges, British Embassies in Dublin, Berlin and Sana (Yemen), offices in Finsbury Square and the City of London with Eric Parry architects and Foster + Partners. He was also responsible for the extension to the Tate Modern with Herzog & de Meuron, and the extension to the British Museum with Rogers Stirk Harbour + Partners. Throughout his career Mark has been engaged with the teaching of engineering at various schools of architecture including Oxford Brookes, Cambridge, University of East London, the Architectural Association and The Bartlett. Speaking of the new appointments, Professor Bob Sheil, Director of The Bartlett School of Architecture, says: "Both of these appointments are of immense importance and significance for The Bartlett School of Architecture and UCL. Both Robert and Mark bring a vast amount of exemplary experience to our teaching and research cultures and activities. We are very excited with the prospect such colleagues will bring to the school and look forward to building even stronger ties between practice, industry and innovation." Professor Alan Penn, Dean of The Bartlett, comments: "I am very pleased that Robert and Mark have agreed to become visiting professors. Robert has been at the centre of all developments in architectural computing over the last 40 years, and has been associated with The Bartlett for most of that time. It would be no exaggeration to say that the UK’s world lead in all matters to do with the use of computers in architectural design come from the influence and developments that Robert has made. Mark is a central figure in the UK's amazing engineering community and brings with him unparalleled experience in both engineering and education."